Described as the heart of John Dewar and Sons, the inspiration for its blends and their physical and spiritual home, the history of Aberfeldy is one of opportunism, innovation, passion and endurance. Today, the distillery’s output continues to be an essential part of the Dewar’s blends and also serves as home to Dewar’s World of Whisky. Aberfeldy produces 53,000 litres of spirit each week, six times what the distillery produced when it opened over a century ago. Aberfeldy’s water is drawn from a natural artesian Spring, the Pitilie Burn, a mile-and-a-half away, which bubbles up from deep underground and is steeped in different minerals. 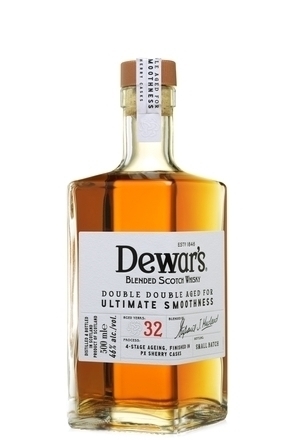 Unusually, Aberfeldy sources all of its barley (presently Optic variety) exclusively from Scottish farmers and this is malted to Aberfeldy’s specifications (unpeated) by Simpsons in Berwick-Upon-Tweed with some 120 tonnes of malted barley delivered to the distillery each week. This is milled using a Porteus mill, in operation since 1962, into a grist with an industry standard consistency of 70% heart, 20% husk and 10% flour. The grist is loaded into the 6.3 tonne capacity stainless steel full-Lauter mash tun which is filled with water and drained there times, the first water being at 80°C, the second water at 75° and the last water 85°C. The sugary ‘wort’ resulting from the first two waters is pumped to the washbacks while the third water (sparge) is held for use as the first water in the next mashing. The spent grain left in the mashtun is used for animal feed or increasingly burnt for sustainable energy production. The distillery’s washbacks are a mixture of Siberian larch wood and stainless steel (eight wooden washbacks indoors and two stainless steel externally). Aberfeldy’s distillers say they detect little difference in the wash produced by the two different types of washback, stating it’s the length of fermentation that’s important, not the type of washback. Each washback holds 33,000 litres of wort to which 140 litres of Mario and Quest yeast is added. Fermentation lasts 72-88 hours, a relatively long fermentation by industry standards, producing a 8% alcohol by volume wash. Aberfeldy’s distillers say that it is during fermentation that the honeyed sweet characteristic of Aberfeldy single malt is introduced. Aberfeldy’s indirect steam coil heated onion shaped copper pot stills are of medium size and height. The two wash stills are charged with 16,600 litres and the two slightly smaller spirit stills are charged with 15,000 litres (15,121 litre capacity). All four stills have vertical shell and tube condensers. The wash from one washback is divided between the two wash stills for the first distillation which lasts around four hours and produces a distillate between 22–26% alc./vol. The second distillation, in the spirit still, is run slowly to maintain the signature Aberfeldy character and lasts for eight hours producing new-make spirit at 68–72% alcohol by volume. 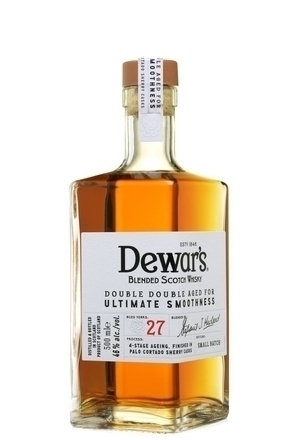 The new-make spirit is driven 70 miles by tanker to Dewar’s maturation and bottling plant in Glasgow. Here the whisky is stored mostly in ex-American bourbon barrels, with around 10% refill European oak, for a minimum of three years and anywhere up to 21 years. Aberfeldy operates 24-7 producing 2.8 million litres of spirit annually, only closing for a month early in the summer each year when water supplies are at their lowest to allow allows repairs and deep cleaning. 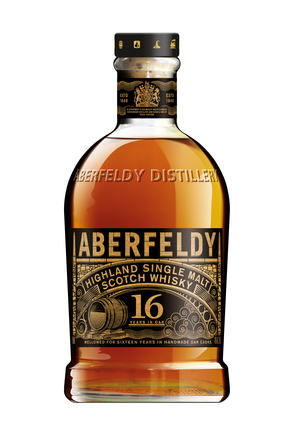 Released in January 2016, Aberfeldy 16 finishes its maturation in casks previously seasoned with oloroso sherry. Launched in October of 2005, this highly respected 21-year-old Highland single malt whisky is the flagship of the Aberfeldy range.